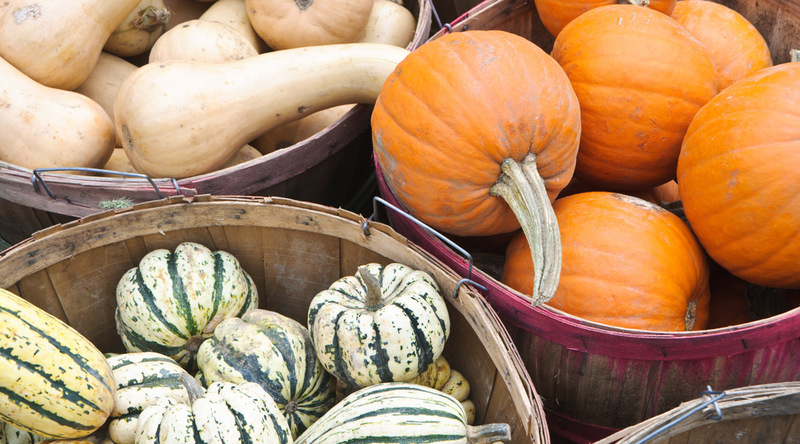 Pumpkin pie, butternut ravioli, and pumpkin spice lattes are beloved by many, but there are many more ways to enjoy winter squash than just these popular treats! The winter squash category of vegetables offers sweet flavor, hearty texture, and rich mouthfeel. Additionally, pumpkin, butternut, acorn, kabocha, delicata, spaghetti, and other squashes are high in fiber, which will help keep you feeling full for hours. Inside their hard rind, the flesh of winter squashes is usually yellow or orange. That’s because these vegetables get their color from carotenoids (the antioxidant also nutrient made famous by carrots) that convert to vitamin A and are great for the health of your eyes, heart, and immune system. Squashes are also packed with vitamin C, potassium, and multiple forms of vitamin B. The bonus? It’s ridiculously easy to make tasty and filling plant-based recipes using butternut, acorn, pumpkin, and other squashes. Try one of the following recipes to enhance your squash game — we’re confident that you and those you feed will come out winners! Bake. Cut squash in half, removing seeds and place pieces face down in a baking dish with ½ inch of water, and put in a preheated 375-degree oven. Bake for 45 minutes, flipping over after 30 minutes. Roast. Drizzle halved squashes with 1 tbsp of oil and place face up on a cookie sheet. Roast in a preheated 375-degree oven for 45 minutes. Sure, it’s easy to open the freezer and pull out a veggie patty, but if you’ve looked at how many ingredients the average meat-free burger contains, you may want a simpler, whole-food version. 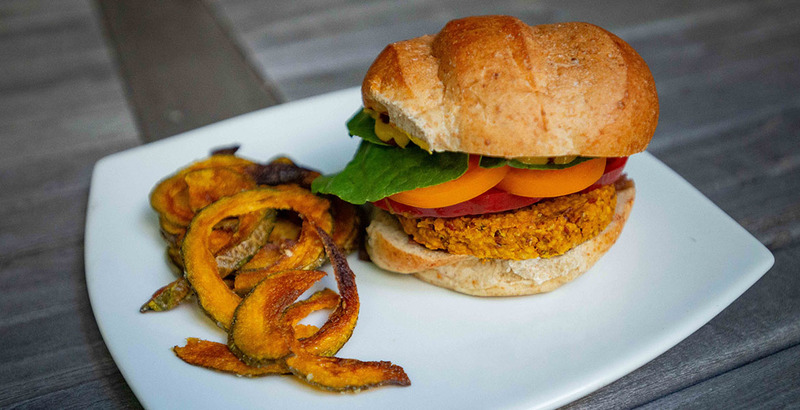 Enter butternut burgers, which combine a few simple ingredients into a tasty main course with plenty of fiber and protein. Even better, you just mix everything together, form into patties, and toss into the oven to let them crisp up on their own — no monitoring needed! 2. Mash kidney beans and butternut together in a mixing bowl, then add all remaining ingredients and mix well. 3. Form into patties and place on a lined cookie sheet. The perfect pairing for a butternut burger, or excellent as a snack on their own, this version of French fries is one you can feel good about eating! Besides not being, well, fried, kabocha squash is an upgrade from white potatoes for multiple reasons: their naturally sweet flavor requires less dipping in sugar-laden ketchup, they have a whopping 70% of your recommended daily allowance of vitamin A per serving, and at only 30 calories per cup of squash, you can indulge without guilt. Coating the squash slices in rice flour is an inexpensive way to provide extra crunch. You could use wheat flour, but rice flour is less inflammatory and is a source of the important nutrient choline. 2. Toss all ingredients together in a mixing bowl and stir until kabocha slices are coated. 3. Place slices on a baking sheet and bake until browned and crispy, about 30 minutes. This versatile dish is more a meal idea than a recipe because it’s so flexible. 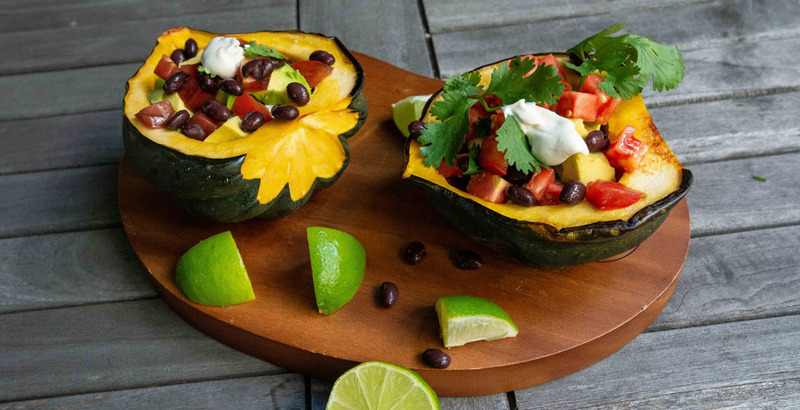 Making burrito bowls is a great way to use up leftover cooked vegetables, grains, and/or legumes, and using cooked acorn squash as the bowl, not only cuts down on dishes, but bulks up the meal! While you could use a store bought dairy-free sour cream in a pinch, this cashew cream has no artificial thickeners or gums, and has more vitamins and minerals than a packaged version. For extra ease, simply lay out ingredients and let everyone choose their own fillings. The options for a burrito bowl bar are limited only by your imagination and what you have on hand, so you can enjoy it a different way each time! Pile fillings into cooked squash, and top with cashew sour cream. For a bigger bowl, partially hollow out the squash (setting the meat aside for later) before filling it. Soak cashews in water for at least one hour, then rinse. Blend all ingredients together in a blender until creamy and uniform in texture. Ah, the PSL: those who love it are often called “basic,” yet the truth is that most of us get pretty darned excited when pumpkin spice latte season returns each year. This recipe takes the spice blend of cinnamon, nutmeg, cloves, and ginger and makes it yummier when you create a coffee mashup and add chocolate flavor. Chocolate naturally contains multiple uplifting chemicals, contributing further to the fun feels of the drink. 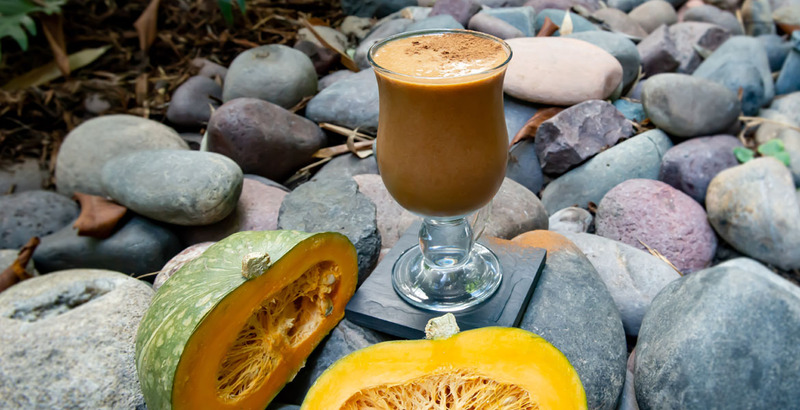 Choosing pumpkin as a real food instead of a syrup thickens the drink and brings fiber to moderate the caffeine absorption, leading to a slower, milder buzz rather than a crash-and-burn fast one. You can save time by using ready-made cooked pumpkin puree. Blend all ingredients together in a blender until uniform and frothy. Bolognese is a meaty Italian sauce known for its long, slow cooking time. Swapping lentils for the meat not only speeds up cooking, it’s better for your health and the planet! This recipe was designed for easy weeknight convenience: lentils are available pre-cooked, and you can buy a pre-made mirepoix mix of carrot, celery, and onion at many grocery stores to save chopping time and money. This version of spaghetti Bolognese is much lighter and healthier than the classic, so there’s no need for guilt when you inevitably go back for seconds! Toss together squash, olive oil, and salt, and set aside. 1. Add olive oil to a sauce pan over med-high heat. 2. Add mirepoix and sauté until slightly browned, about 10 minutes. 3. Add seasonings and tomato puree; sauté 2-3 minutes until puree darkens. 4. Add vegetable broth and bring to a boil. 5. Reduce heat to simmer and let cook down for 15 minutes, then add lentils and cook an additional five minutes. 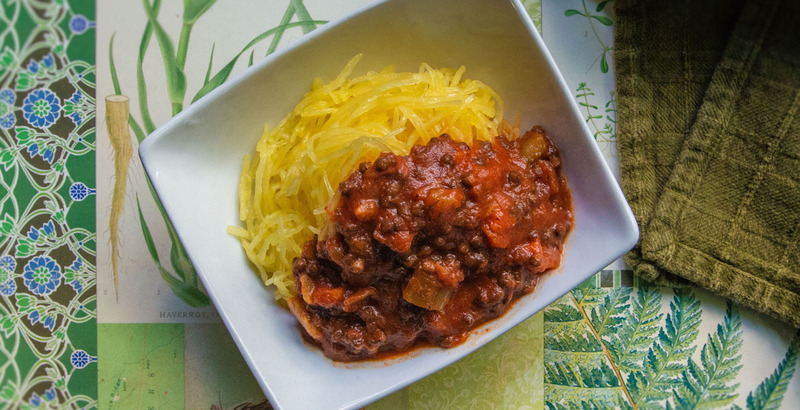 Place 1 ½ cups spaghetti squash on a plate or in a bowl, and top with a heaping cup of sauce. Food styling by Ariane Resnick, C.N.C. Hungry? Pre-order the OMD Book today to get a free 7-day Meal Planner, Shopping List and OMD tracker!